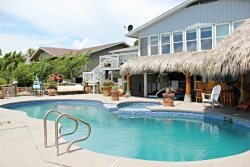 A Fin N Feather is a three bedroom, three bath, two story canal front home located in Copano Cove. There is plenty of room to tie up your boat behind the home. Enjoy fishing during the day under the sun and at night with the underwater green light. Upstairs you will find two bedrooms and two bathrooms. Each bedroom has a wall mounted television and chest of drawers, a queen bed, and one room also has a full futon. The living room is open to the kitchen and dining room and has views of the canal. Downstairs bedroom has a daybed with a trundle bed and wall mounted television. The bathroom opens to the bedroom and outside patio. The kitchen is fully equipped with all appliances and dining ware included, microwave, dishwasher and ice maker. The inside dining table seats 6 and plenty of outside seating to enjoy your morning coffee or evening desert. At A Fin N Feather the canal is the perfect place to relax, fish and bird watch. Birds and ducks live in the canal including pelicans (brown and white), herons, king fishers and egrets to name a few. You can catch redfish, trout and black drum from the dock or take your own boat or kayak out into the bay. Pets are also welcome! We had an issue with our first rental and used the after hours number and were responded to immediately. Went to Miss Kitty office next morning and met the staff and I see why they are successful. Their friendliness,customer service and resolution of our issue was first class. Rent from Miss Kitty's and you will be please beyond your expectations!